Those watching carefully would have noticed that the reduced rotating stage, rotates with an eccentric movement. This isn’t very useful unless you require an eccentric output. The standard way of converting the eccentric motion back to concentric rotation is to use an output disk with roller pins, rolling in circles cut in the cam. The picture below shows my demonstration gearbox. 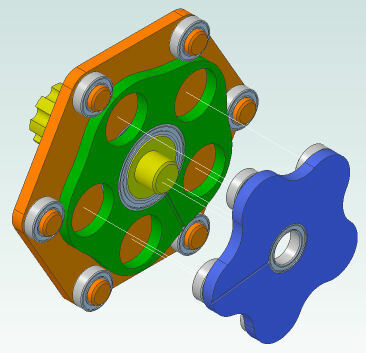 The diameter of the circles in the cam are [Bearing Diameter] + 2 x [Eccentric Offset]. The output rollers suffer the same problems that the roller pins on the base do. The next post will show a completed gearbox.